Want to save some serious cash on your cruise? Then it starts with knowing where to park. The official parking provided by the port is by far the most convenient. There are two main garages. The Northport parking garage has 2,500 spaces and serves cruise terminals 1 and 2. The Midport garage serves terminals 19, 21, 22, 24, 25, 26, 27 and 29 with 2,000 spots. In addition there are surface lots available at the port with another 1,000 parking spots for other terminals and overflow parking. What these official parking lots provide in convenience, they make up for with price. Parking fares are $15 per day for a regular car; $19 for oversized vehicles. Keep in mind those rates are likely to give you garage parking, which makes the higher cost a little easier to swallow. As well, you can’t beat the location right next to the cruise terminals. One note — if you have a Florida toll exemption permit, a specially modified vehicle (ramps or special controls) for the disables, or a Florida disabled veteran license plate, then you can have your parking fees waved. Park ‘N Go offers parking just a few blocks from the port, but for much cheaper than you’ll pay at official port parking. If booked online, Park ‘N Go offers a discounted rate. The rate varies from $9-11 per day plus fees and taxes when booked online. That would be a good deal anywhere, but with a parking lot so close to the Port Everglades entrance, that deal is exceptional. If you decide to use this service, we highly recommend booking online before hand. While the Internet rate is $9-11 plus tax, the drive-up rate is $13 per day. Park ‘N Go also offers a free shuttle ride to the port. Don’t let the name fool you. Park ‘N Fly offers cruise parking in addition to airport parking. Located across the street from Park ‘N Go, this lot also offers a very convenient location right next to Port Everglades, but you will pay a bit more. The lot has two tiers of rates. If you stay less than six days, then the daily rate is $14 plus taxes. But if you book parking for six days or more, then the rate is cut almost in half to $8 per day. That actually leads to some weird pricing where paying for more days can be cheaper than a shorter stay. While the $14 rate is a little steep (it’s only $1 more per day to park at the port), the $8 rate for longer cruises is a good deal. The name is confusing. Fort Lauderdale Airport Parking isn’t official airport parking — it’s an independent lot that also provides cruise parking. Don’t think you’re parking right at the airport. In fact, the lot is pretty small and cars are packed tight. The daily rate for cruise passengers is $10 per day (if you’re a first-time parker, website specials have a rate as low as $3 per day, however, this appears to be only for airport parkers, not cruisers). If you have an oversized vehicle, we’d recommend trying another lot because of space concerns. FLL Park Safe: Located on the south side of the Fort Lauderdale airport, this parking lot is a bit farther than the rest of the lots we’ve covered. However, it is one of the most well-reviewed cruise parking lots and still plenty close. Your lowest cruise parking rates ($9 per day) are available if you prepay and book online ahead of time. There is also covered parking available for $11 per day. Otherwise you will pay a $2 per day higher rate at the lot. A free shuttle to the port is included with your rate. The cheapest option for parking in Fort Lauderdale for a cruise, this lot is located south of the airport and cruise port. While it is a little farther from the port than other lots, it is also among the cheapest at just $6 per day plus taxes/fees. Drive-up rates may be slightly more as the company says that rates are subject to change. The free shuttle (for the first four passengers in a car) to the port takes only about 10 minutes. There is no RV parking available at this location. The newest choice in cruise parking is located right next to the port but offers considerably cheaper rates. Discount Parking FLL has 400 spots for both airport and cruise parking. Rates start at $6.95 per day for valet parking and a shuttle to the cruise port. That rate applies if you book online ahead of time. The drive-up rate is a considerably higher $10.95 per day. There is also a loyalty program that can earn you discounted parking if you are a frequent cruiser. If you are staying in the Fort Lauderdale area, contact your hotel to see if they will allow you to park your car for the length of your cruise. Many hotels cater to cruisers and have special daily parking rates and free shuttles. Here is a list of hotels in the area with cruise parking. Why Am I Being Charged for 8 Days of Parking for a 7-Day Cruise? You’ll notice that lots charge by the day. For some, they count each day that you park there as a full day. So if you arrive a noon on Sunday for a 7-day cruise, that first Sunday is a full day. When to get back to port the next Sunday, you’ll also be charged for that day too, even though you will usually leave by 10 a.m. It can be frustrating, but that’s the way it is. Is Free Parking Available Anywhere? South Florida is densely populated, which means parking space is at a premium. The only place that will have free parking are some hotels that offer park and cruise deals to entice guests. Everywhere else will charge you to park. If you are disabled, then you might qualify for free parking at Port Everglades. Those with toll exemptions permits, specially modified vehicles or disabled veteran plates can get free parking. What’s the Cheapest Fort Lauderdale Cruise Parking? The cheapest lots we’ve found are Discount Parking FLL and Park by the Ports. They offer rates around $50 for a week-long cruise. That’s hard to beat and less than half the cost of parking at the Port Everglades cruise terminals. Getting to Port Everglades — Transportation options from airports and the area to the cruise port. Everything you need to know to get to the port and start your vacation. Port Everglades Cruise Parking — Parking at the port? We’ve got you covered with all your parking options, including costs and discounts. 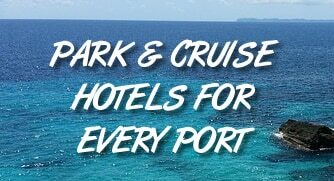 Port Everglades Park and Cruise Hotels — If you plan to stay in the area the night before your cruise, look at this list of hotels that offer cruise parking with a one-night stay. Just been on their website and they are charging $15 per day, or $13.5 per day if booked online. Thanks for letting us know. We looked into it. You’ll find cheaper rates for booking farther in advance. Rates are higher if booking closer to the cruise date. Park By the Ports is charging 9.99 per day for a regular sized car. Brent, we’d suggest calling the parking lots directly. They will likely let you park at a discount for the long stay. What is the closest to the port everglade to park and go .